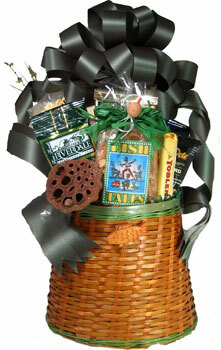 This useable Fishing Creel is filled with lots of goodies! Focaccia Crisps Crackers, Smoked Salmon, Flavored Popcorn (English Toffee or French Vanilla), Chocolate filled Wafer Rolls, Nuts, "Fish Tales" Snack Mix (it's topped off with a bow and a fishing lure with line), and Cheese. Wrapped in Crisp Clear Cellophane and topped up with a Handmade Bow. Includes a Handwritten Greeting Card. Add a Fishing Themed Photo Frame for photograph of "the one that DIDN'T get away".